Apple’s Logic Pro and Express 7.2 were the first major music applications out the door with support for Intel Macs when they came out early this spring. As a result, though, Apple was a bit ahead of the curve: the Intel Mac ReWire SDK wasn’t available yet from Propellerhead, so Apple couldn’t include support for ReWire on Intel Macs. (ReWire works just fine on Logic 7.2 if you’re running a PowerPC-based Mac.) That didn’t matter at first — until Ableton Live shipped, complete with ReWire support. 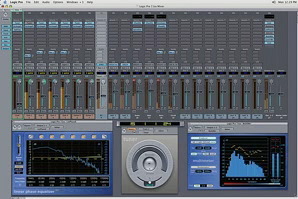 Well, in case you haven’t checked Software Update lately, Mac Logic users, ReWire is here. And it’s a joy to use, finally, because Apple has added support for stereo ReWire objects and labels its ReWire I/O correctly. That means you can run a MacBook Pro or Intel mini with your Intel-native copy of Live ReWired into your Intel-native copy of Logic (which is blazingly fast on Intel, I might add), all with your Intel-native drivers from the likes of MOTU, M-Audio, and Edirol. Why it’s just about musical nirvana for laptop-based musicians. Now we just need the Native Instruments stuff and Max/MSP for a complete Intel Mac laptop experience. You can expect both to ship well before anything with the Adobe name on it. Snicker at your graphic artist friends, because you know you want to — oh, wait, I use Adobe software. Uh, never mind then. Lots of other little tweaks that correct some major issues with 7.2; details after the jump. I’ve said it before, but I’ll say it again: if you’re using Logic, you absolutely have to get 7.2, whether you’re using an Intel or PowerPC-based Mac. It just fixes a lot of Logic’s remaining rough edges. The easiest way to get the update is via the Software Update System Preferences pane.